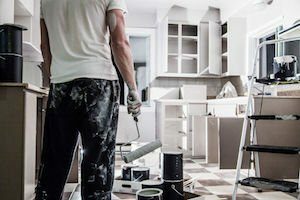 Painting might seem like the obvious first step to freshen a property. But it might not be necessary if the existing paint is a neutral color and in good condition. Instead, consider adding crown molding. It gives the room a more finished, polished look. Even better, you don’t have to tear anything out to do the installation. Window treatments instantly improve the appearance of a rental property. Keep these simple (wide wooden blinds are a classic option). Stay away from fussy drapes or delicate curtains that accumulate dust and fade in the sun. A big kitchen island or an overhead array of hanging pots and pans might be eye-catching. But simpler is often better when it comes to this area of the home or condo. What is popular now may be out of style in a few years. Focus on what everyone likes about kitchens—room to move around, no clutter, and lots of storage space. You don’t have to splurge on countertops; granite is not always the best countertops for rentals. Put new facing on the cabinets or install a nice backsplash instead. These are just a few rental property kitchen renovation ideas. Update lighting fixtures to add brightness to dimly lit areas. Choose modern styles to update the room—and make sure they are energy efficient. Your tenants will appreciate the savings. Put in new faucets in the kitchen and bathroom for another quick fix. Prospective tenants know they will interact with lighting and plumbing over and over throughout a typical day. They are likely to notice and appreciate these small touches. New carpet makes a rental property look great. But it doesn’t hurt to see if those carpets can be cleaned a few more times before replacement. Only replace the carpet if it is worn down or there are stains that can’t be removed. If you opt to replace carpet with wood or other hard surfaces, consider carefully whether they will wear well. Darker woods show dust, while lighter ones may be stained by improper care. Never install any type of wood floor if you will allow renters to keep pets in the home. Between sharp claws and house training accidents, the chances of damage are high. Paler colors make a room seem brighter and more spacious. But going too light can backfire. For example, an all-white bathroom will only look great if it is spotlessly clean. A single smudge or piece of lint can make it look dirty. Select washable paints in neutral colors for areas that will require frequent cleaning. Landscaping is a quick way to improve the appearance of your rental property. But it can be expensive. Consider shrubs and small trees as long-term renovation investments. You might not want to pay for expensive vegetation if you will be selling the property in five years. Instead, opt for a nicely planted flowerbed that can be stocked with lovely blooms to make the house instantly inviting. To find professionals you can trust to handle renovating your rental property, contact our team today.